1 Second Meeting of the Open-ended Tripartite Working Group on the Follow-up to the Review of the Cooperation of UNESCO s Secretariat with National Commissions for UNESCO February 2013, Room XII, UNESCO Headquarters Draft Discussion Paper I. Legal Framework and Structural Issues Finding and Recommendation 1 The UNESCO Constitution (Article VII) and the Charter of National Commissions for UNESCO set the foundations and legal framework for the establishment and functioning of National Commissions. They specify basic roles and responsibilities of the UNESCO Secretariat, Member State Governments and National Commissions in this regard. Certain additional responsibilities have been given to National Commissions (for example, in the fields of decentralization, public information, partnerships with civil society, and use of UNESCO s name and logo) by subsequent resolutions and decisions of the General Conference and the Executive Board (Ref. Resolutions 27 C/ 13.12, 28 C/13.5, 29 C/60, 30 C/83, 34 C/86 and Decision 174 EX/34). 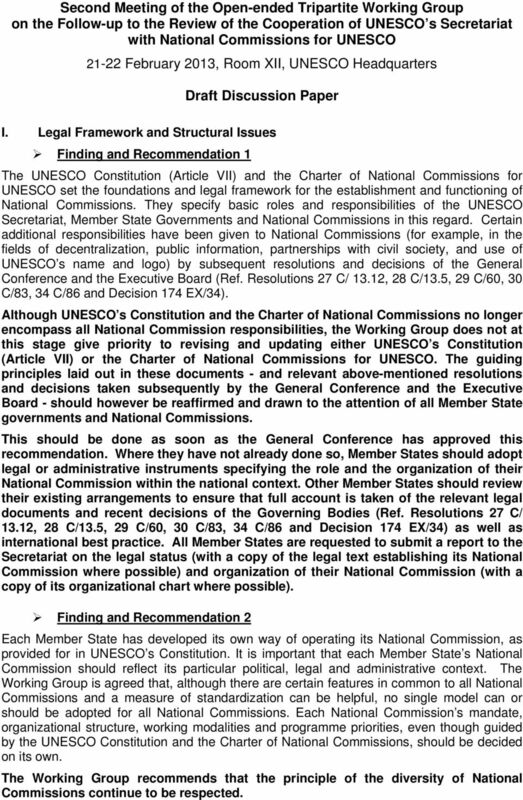 Although UNESCO s Constitution and the Charter of National Commissions no longer encompass all National Commission responsibilities, the Working Group does not at this stage give priority to revising and updating either UNESCO s Constitution (Article VII) or the Charter of National Commissions for UNESCO. The guiding principles laid out in these documents - and relevant above-mentioned resolutions and decisions taken subsequently by the General Conference and the Executive Board - should however be reaffirmed and drawn to the attention of all Member State governments and National Commissions. This should be done as soon as the General Conference has approved this recommendation. Where they have not already done so, Member States should adopt legal or administrative instruments specifying the role and the organization of their National Commission within the national context. Other Member States should review their existing arrangements to ensure that full account is taken of the relevant legal documents and recent decisions of the Governing Bodies (Ref. Resolutions 27 C/ 13.12, 28 C/13.5, 29 C/60, 30 C/83, 34 C/86 and Decision 174 EX/34) as well as international best practice. All Member States are requested to submit a report to the Secretariat on the legal status (with a copy of the legal text establishing its National Commission where possible) and organization of their National Commission (with a copy of its organizational chart where possible). Finding and Recommendation 2 Each Member State has developed its own way of operating its National Commission, as provided for in UNESCO s Constitution. It is important that each Member State s National Commission should reflect its particular political, legal and administrative context. The Working Group is agreed that, although there are certain features in common to all National Commissions and a measure of standardization can be helpful, no single model can or should be adopted for all National Commissions. Each National Commission s mandate, organizational structure, working modalities and programme priorities, even though guided by the UNESCO Constitution and the Charter of National Commissions, should be decided on its own. The Working Group recommends that the principle of the diversity of National Commissions continue to be respected. 2 ~ 2 ~ II. Actions to be taken by individual Member States, including Permanent Delegations and National Commissions Finding and Recommendation 3 Member States have primary responsibility for providing their Commissions with appropriate status and authority as well as the human and financial resources needed to carry out the work of their National Commission in accordance with UNESCO s Constitution and the Charter of National Commissions. The Working Group recommends that all Member States review the status and structure of their National Commissions to ensure that they have the authority and capacity to work effectively with government agencies as well as intellectual communities, civil society partners, UNESCO Secretariat at Headquarters and field offices and other National Commissions. 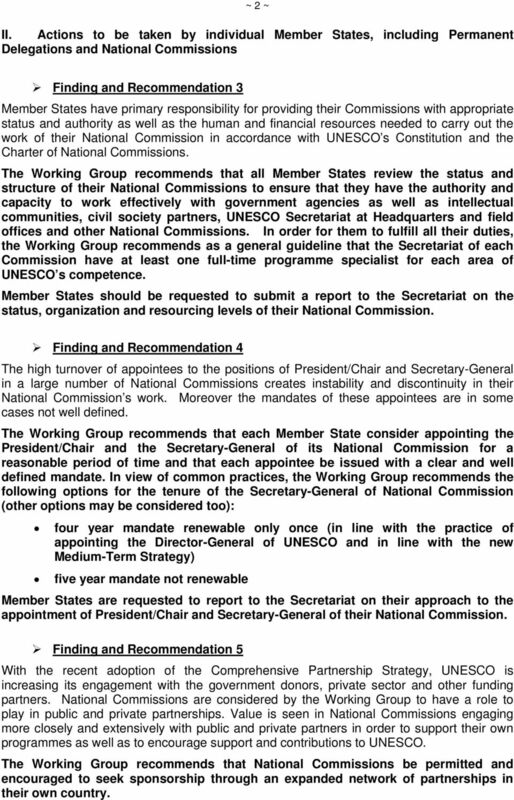 In order for them to fulfill all their duties, the Working Group recommends as a general guideline that the Secretariat of each Commission have at least one full-time programme specialist for each area of UNESCO s competence. Member States should be requested to submit a report to the Secretariat on the status, organization and resourcing levels of their National Commission. Finding and Recommendation 4 The high turnover of appointees to the positions of President/Chair and Secretary-General in a large number of National Commissions creates instability and discontinuity in their National Commission s work. Moreover the mandates of these appointees are in some cases not well defined. The Working Group recommends that each Member State consider appointing the President/Chair and the Secretary-General of its National Commission for a reasonable period of time and that each appointee be issued with a clear and well defined mandate. In view of common practices, the Working Group recommends the following options for the tenure of the Secretary-General of National Commission (other options may be considered too): four year mandate renewable only once (in line with the practice of appointing the Director-General of UNESCO and in line with the new Medium-Term Strategy) five year mandate not renewable Member States are requested to report to the Secretariat on their approach to the appointment of President/Chair and Secretary-General of their National Commission. Finding and Recommendation 5 With the recent adoption of the Comprehensive Partnership Strategy, UNESCO is increasing its engagement with the government donors, private sector and other funding partners. National Commissions are considered by the Working Group to have a role to play in public and private partnerships. Value is seen in National Commissions engaging more closely and extensively with public and private partners in order to support their own programmes as well as to encourage support and contributions to UNESCO. The Working Group recommends that National Commissions be permitted and encouraged to seek sponsorship through an expanded network of partnerships in their own country. 3 ~ 3 ~ This could result in additional funding for National Commission programmes and activities as well as greater support for UNESCO. To assist in this, the experience and expertise of experienced National Commissions in carrying out fund-raising activities should be developed and promoted from the next programme cycle ( ). Member States are invited to report to the Secretariat on actions taken pursuant to this recommendation, and on any lessons learned or experience gained that might be useful to other National Commissions. Finding and Recommendation 6 A number of National Commissions have recently started to work more closely with the various UNESCO networks and civil society partners in their respective countries. These networks include UNESCO Chairs, National Committees of Intergovernmental Programmes, networks such as ASPnet, UNESCO Clubs and Associations, Category 2 Centres and Non- Governmental Organizations. Given the large number and great diversity of these networks, coordination and governance are often needed to better monitor and facilitate their activities. National Commissions are well placed to play such a facilitating, coordinating and monitoring role. 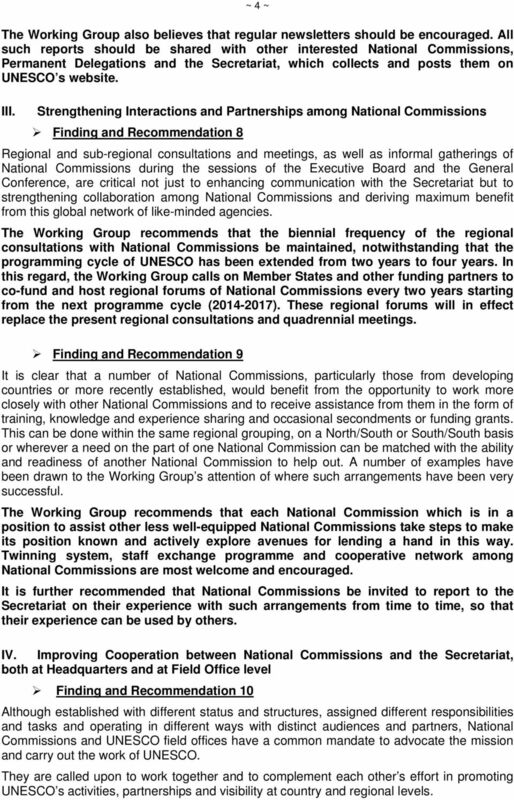 The Working Group recommends that National Commissions consider ways of engaging more closely with the larger UNESCO family, partners and networks in their country, with a view to providing advice, guidance and, as appropriate, coordination and support. National Commissions have a particular role to play (under the relevant Directives) on the use of UNESCO s name, acronym, logo and internet domain names. Member States are requested to report to the Secretariat on steps taken to create synergies and work more closely with the UNESCO-related bodies in their country. The Working Group also recommends that National Commissions actively work with NGOs based in their respective countries, including national branches of those international NGOs which have established official relations with UNESCO in line with the new Directives concerning UNESCO s partnership with non-governmental organizations. They should contribute to the fostering of UNESCO s partnership with NGOs by identifying and helping new interested non-governmental partners to join the UNESCO-NGO network. 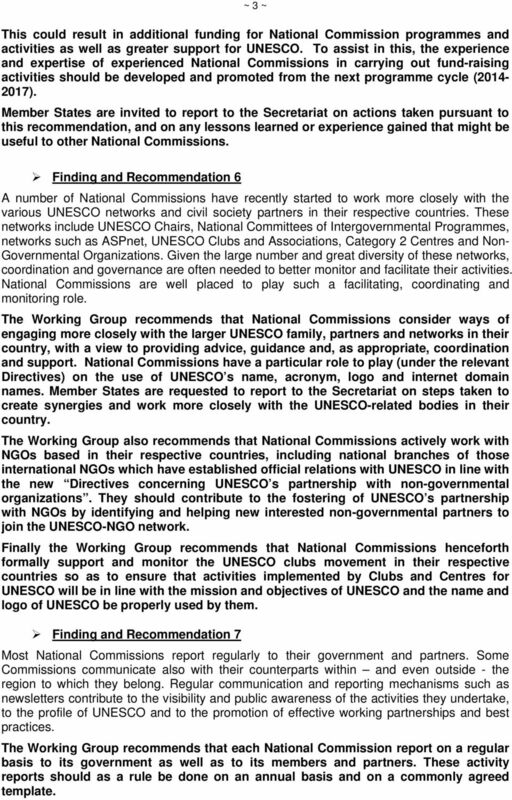 Finally the Working Group recommends that National Commissions henceforth formally support and monitor the UNESCO clubs movement in their respective countries so as to ensure that activities implemented by Clubs and Centres for UNESCO will be in line with the mission and objectives of UNESCO and the name and logo of UNESCO be properly used by them. Finding and Recommendation 7 Most National Commissions report regularly to their government and partners. Some Commissions communicate also with their counterparts within and even outside - the region to which they belong. Regular communication and reporting mechanisms such as newsletters contribute to the visibility and public awareness of the activities they undertake, to the profile of UNESCO and to the promotion of effective working partnerships and best practices. The Working Group recommends that each National Commission report on a regular basis to its government as well as to its members and partners. These activity reports should as a rule be done on an annual basis and on a commonly agreed template. 4 ~ 4 ~ The Working Group also believes that regular newsletters should be encouraged. All such reports should be shared with other interested National Commissions, Permanent Delegations and the Secretariat, which collects and posts them on UNESCO s website. III. Strengthening Interactions and Partnerships among National Commissions Finding and Recommendation 8 Regional and sub-regional consultations and meetings, as well as informal gatherings of National Commissions during the sessions of the Executive Board and the General Conference, are critical not just to enhancing communication with the Secretariat but to strengthening collaboration among National Commissions and deriving maximum benefit from this global network of like-minded agencies. The Working Group recommends that the biennial frequency of the regional consultations with National Commissions be maintained, notwithstanding that the programming cycle of UNESCO has been extended from two years to four years. In this regard, the Working Group calls on Member States and other funding partners to co-fund and host regional forums of National Commissions every two years starting from the next programme cycle ( ). These regional forums will in effect replace the present regional consultations and quadrennial meetings. Finding and Recommendation 9 It is clear that a number of National Commissions, particularly those from developing countries or more recently established, would benefit from the opportunity to work more closely with other National Commissions and to receive assistance from them in the form of training, knowledge and experience sharing and occasional secondments or funding grants. This can be done within the same regional grouping, on a North/South or South/South basis or wherever a need on the part of one National Commission can be matched with the ability and readiness of another National Commission to help out. A number of examples have been drawn to the Working Group s attention of where such arrangements have been very successful. The Working Group recommends that each National Commission which is in a position to assist other less well-equipped National Commissions take steps to make its position known and actively explore avenues for lending a hand in this way. Twinning system, staff exchange programme and cooperative network among National Commissions are most welcome and encouraged. It is further recommended that National Commissions be invited to report to the Secretariat on their experience with such arrangements from time to time, so that their experience can be used by others. IV. Improving Cooperation between National Commissions and the Secretariat, both at Headquarters and at Field Office level Finding and Recommendation 10 Although established with different status and structures, assigned different responsibilities and tasks and operating in different ways with distinct audiences and partners, National Commissions and UNESCO field offices have a common mandate to advocate the mission and carry out the work of UNESCO. They are called upon to work together and to complement each other s effort in promoting UNESCO s activities, partnerships and visibility at country and regional levels. 5 ~ 5 ~ The respective roles of these two networks are not clearly defined, and in some cases there is considerable confusion and misunderstanding about their respective responsibilities and roles. Inadequate communication and consultation between the two entities is widespread. 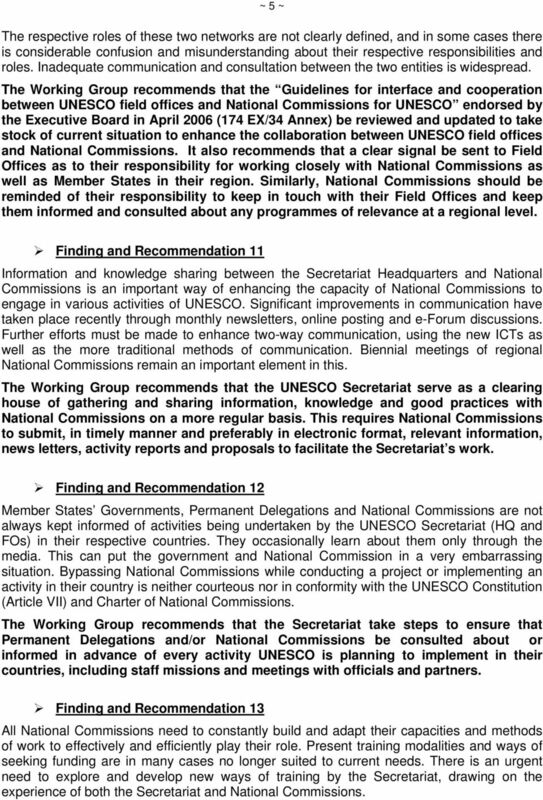 The Working Group recommends that the Guidelines for interface and cooperation between UNESCO field offices and National Commissions for UNESCO endorsed by the Executive Board in April 2006 (174 EX/34 Annex) be reviewed and updated to take stock of current situation to enhance the collaboration between UNESCO field offices and National Commissions. It also recommends that a clear signal be sent to Field Offices as to their responsibility for working closely with National Commissions as well as Member States in their region. Similarly, National Commissions should be reminded of their responsibility to keep in touch with their Field Offices and keep them informed and consulted about any programmes of relevance at a regional level. Finding and Recommendation 11 Information and knowledge sharing between the Secretariat Headquarters and National Commissions is an important way of enhancing the capacity of National Commissions to engage in various activities of UNESCO. Significant improvements in communication have taken place recently through monthly newsletters, online posting and e-forum discussions. Further efforts must be made to enhance two-way communication, using the new ICTs as well as the more traditional methods of communication. Biennial meetings of regional National Commissions remain an important element in this. The Working Group recommends that the UNESCO Secretariat serve as a clearing house of gathering and sharing information, knowledge and good practices with National Commissions on a more regular basis. This requires National Commissions to submit, in timely manner and preferably in electronic format, relevant information, news letters, activity reports and proposals to facilitate the Secretariat s work. Finding and Recommendation 12 Member States Governments, Permanent Delegations and National Commissions are not always kept informed of activities being undertaken by the UNESCO Secretariat (HQ and FOs) in their respective countries. They occasionally learn about them only through the media. This can put the government and National Commission in a very embarrassing situation. Bypassing National Commissions while conducting a project or implementing an activity in their country is neither courteous nor in conformity with the UNESCO Constitution (Article VII) and Charter of National Commissions. 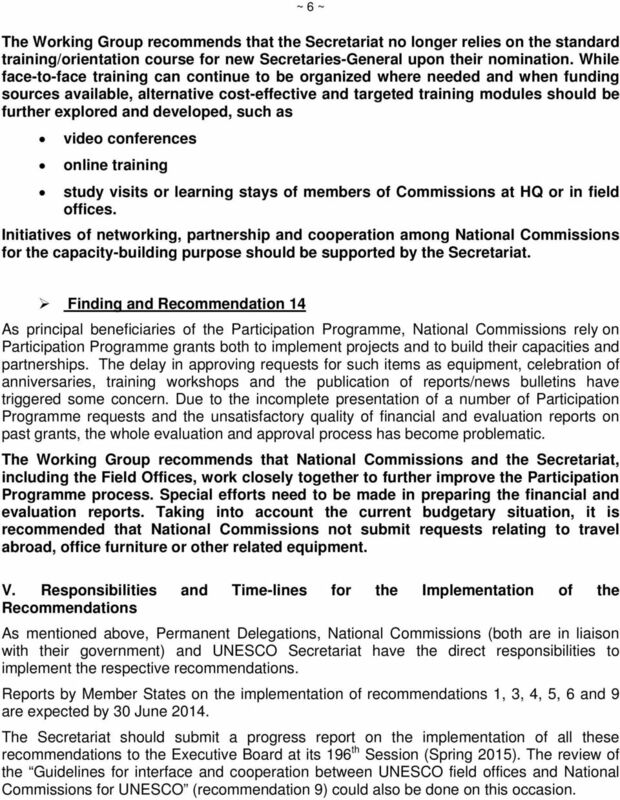 The Working Group recommends that the Secretariat take steps to ensure that Permanent Delegations and/or National Commissions be consulted about or informed in advance of every activity UNESCO is planning to implement in their countries, including staff missions and meetings with officials and partners. Finding and Recommendation 13 All National Commissions need to constantly build and adapt their capacities and methods of work to effectively and efficiently play their role. Present training modalities and ways of seeking funding are in many cases no longer suited to current needs. There is an urgent need to explore and develop new ways of training by the Secretariat, drawing on the experience of both the Secretariat and National Commissions. 6 ~ 6 ~ The Working Group recommends that the Secretariat no longer relies on the standard training/orientation course for new Secretaries-General upon their nomination. While face-to-face training can continue to be organized where needed and when funding sources available, alternative cost-effective and targeted training modules should be further explored and developed, such as video conferences online training study visits or learning stays of members of Commissions at HQ or in field offices. Initiatives of networking, partnership and cooperation among National Commissions for the capacity-building purpose should be supported by the Secretariat. Finding and Recommendation 14 As principal beneficiaries of the Participation Programme, National Commissions rely on Participation Programme grants both to implement projects and to build their capacities and partnerships. The delay in approving requests for such items as equipment, celebration of anniversaries, training workshops and the publication of reports/news bulletins have triggered some concern. Due to the incomplete presentation of a number of Participation Programme requests and the unsatisfactory quality of financial and evaluation reports on past grants, the whole evaluation and approval process has become problematic. The Working Group recommends that National Commissions and the Secretariat, including the Field Offices, work closely together to further improve the Participation Programme process. Special efforts need to be made in preparing the financial and evaluation reports. Taking into account the current budgetary situation, it is recommended that National Commissions not submit requests relating to travel abroad, office furniture or other related equipment. V. Responsibilities and Time-lines for the Implementation of the Recommendations As mentioned above, Permanent Delegations, National Commissions (both are in liaison with their government) and UNESCO Secretariat have the direct responsibilities to implement the respective recommendations. Reports by Member States on the implementation of recommendations 1, 3, 4, 5, 6 and 9 are expected by 30 June The Secretariat should submit a progress report on the implementation of all these recommendations to the Executive Board at its 196 th Session (Spring 2015). The review of the Guidelines for interface and cooperation between UNESCO field offices and National Commissions for UNESCO (recommendation 9) could also be done on this occasion. BECOMING AN NGO, OFFICIAL PARTNER OF UNESCO UNESCO relies on a broad and diverse set of collaborative relationships and partnerships in all parts of the world to pursue its mission and implement its programmes. IX. Projects funded by the United Nations Foundation A. United Nations Foundation operations The United Nations Foundation is a public charity established in 1998 by Ted Turner to support the United Nations. INFORMAL CONSULTATION ON STRATEGIES FOR GENDER EQUALITY- IS MAINSTREAMING A DEAD END? INTERNAL AUDIT DIVISION AUDIT REPORT UNHCR's relationship with implementing partners Management and monitoring of relationships with implementing partners need to be improved 25 March 2010 Assignment No. ST/SGB/2004/8. Secretariat. United Nations. Secretary-General s bulletin Organization of the Office of Human Resources Management. CCAC offers a reasonable salary, flexibility, independence and an opportunity to lead a thriving organization to an even higher level.